Gotta love the Michael Whelan cover art. ﻿﻿If you like epic fantasy, this is a must-read book. I just finished it last week and thoroughly enjoyed it. It's hard to put down! 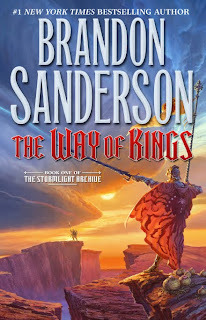 This is the first book of a new multi-volume epic saga by Brandon Sanderson (Twttier: @BrandonSandrson), the guy who is finishing Robert Jordan's Wheel of Time saga. It is obvious that a lot of thought and effort has been put into this novel, from the gorgeous cover by Michael Whelan, to the maps and drawings inside the book and the text itself. The story comes full circle from beginning to end as a stand-alone novel should, and yet it leaves you at changing point, looking forward to what the characters will do in the next volume. You follow three main characters on their separate, yet converging journeys. The author also bounces around other viewpoints of minor characters, which might be confusing (especially at the beginning) for those who are not used to stories of epic proportions, but I liked it; it is a tell-tale sign of an epic. Plus, the story didn't feel rushed or lengthly. I enjoy a 1001-page book that isn't boring but also isn't over too fast. I really love the world that Sanderson creates for this saga. The driving theme is storms, and he brings that into everything from the landscapa, flora and fauna to the style of warfare and the magic system itself. It's truly unique and makes this story stand apart from stereotypical warrior/magic fantasy stories. The story doesn't start in a tavern, it starts on a battlefield. This book is action-packed! I can't wait for the next installment. Are there more potential Radiants we will meet? Will Kaladin and Shallan hook up? What is the deal with the Heralds? found your blog through Etsy, cute party favors below...have a super week! Thanks! Be sure to Follow us, we're updating multiple times each week with new crafts!